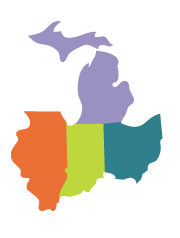 Upper Midwest Telehealth Resource Center (UMTRC) Consortium Partners serve as content experts and informal consultants in their area(s) of expertise to the constituency of the UMTRC service areas of Illinois, Indiana, Michigan, and Ohio. Consortium Partners participate in UMTRC stakeholder meetings, webinars, and other stakeholder events as often as is practical. Following is a list of the current UMTRC Consortium Partners and links to their respective websites.